sesame-roasted "pomme frites" + homemade mayonnaise. For my entire life, I have hated condiments. Anything that slightly resembles ketchup, mustard, pickles, and especially mayonnaise are not allowed within smelling-distance of me (although I can tolerate a small amount of grapeseed oil vegenaise). In fact, my younger sister used to torture me by holding Heinz ketchup packets near my face. Before going to France, I was aware that the French dipped their pomme frites in mayonnaise and I wasn't sure what to think about it. But given my willingness to sacrifice any and all morals for the French, I decided to try it. My first day in France I was dipping fries in mayonnaise so slightly that I was barely aware of it; my last day in France I was spooning out the last bits of mayo with my finger, forgetting about the fries all together. Mayonnaise in France does not come close to resembling Hellman's. It would be offensive to even suggest they are the same thing. 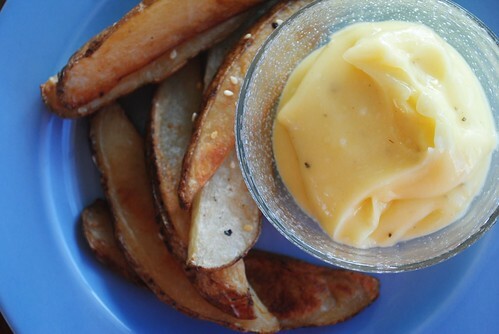 French mayonnaise is creamy (not jiggly), non-smelly, and accompanies pomme frites perfectly. Even though it seems like the recipe calls for a lot of mustard, you can only taste a slight hint of it (which has thus led me to tolerating mustard! I like two condiments!). Recently, I realized that I cannot eat fries with every meal (without consequences) and have been eating a slightly healthier version. I have also vowed to always have homemade mayonnaise in my fridge - for french fries, sandwiches, vegetable-dipping, and anything (and everything) else. 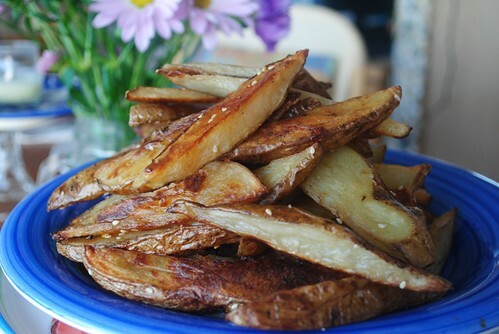 Using whatever potatoes you prefer (russets have a good shape for fries), cover sliced potatoes in equal parts olive oil and sesame oil. Sprinkle with sea salt, pepper, and sesame seeds. Roast for about 40-50 minutes at 450 degrees, turning once after 20 minutes. Using a mixer, mix 1 egg yolk, 1 tablespoon dijon mustard, 1 teaspoon coarse sea salt, and 1 teaspoon ground black pepper. Keeping the mixer on, slowly add 1/2 cup of oil (canola, sunflower, safflower, grapeseed, or olive oil) until it begins to resemble mayonnaise. It's amazing at this point, but I always add a clove of crushed raw garlic. Because I really love garlic.